As fish-eating predators at the top of the marine food chain, elephant seals accumulate high concentrations of mercury in their bodies. A new study by scientists at UC Santa Cruz shows that elephant seals shed significant amounts of mercury during molting, resulting in elevated concentrations of the toxic metal in coastal waters near the elephant seal rookery at Año Nuevo State Reserve. The findings, published September 7 in Proceedings of the National Academy of Sciences (PNAS), reveal a previously unrecognized source of mercury contamination in coastal waters. Mercury is a problem in the marine environment because the most toxic form, methyl mercury, is readily absorbed and accumulates in the bodies of marine organisms. In a process known as "biomagnification," the toxin becomes more and more concentrated as it passes up the food chain. Thus, mercury concentrations in top predators can be 1 million to 10 million times higher than the levels found in seawater. "Many studies have looked at biomagnification up the food chain, and we took that a step further to see what happens next. Mercury is an element, so it never breaks down and goes away--it just changes forms," said first author Jennifer Cossaboon, who led the study as an undergraduate at UC Santa Cruz and is now a graduate student in environmental health at San Diego State University. A 1981 study by coauthor Russell Flegal, professor of microbiology and environmental toxicology at UC Santa Cruz, had found elevated mercury concentrations in mussels near large colonies of seals and sea lions at Año Nuevo and San Miguel Island. "At that time, we didn't have the analytical instruments to detect mercury at the concentrations found in seawater, so we used mussels, which filter seawater, as sentinel organisms," Flegal said. "In the new study, we were able to look at seasonal changes in the water, and during the elephant seal molting season the levels of methyl mercury really took off." Compared to other coastal sites, the concentration of methyl mercury in the seawater at Año Nuevo was twice as high during the breeding season and 17 times higher during the molting season. Elephant seals undergo an annual "catastrophic molt" in which they shed the entire outer layer of skin and hair ("pelage"), which comes off in sheets onto the beach. 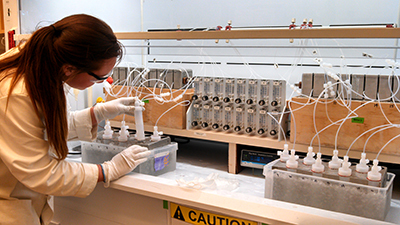 Cossaboon measured high concentrations of mercury in samples of molted pelage collected at Año Nuevo. In the earlier study, Flegal had found high concentrations of mercury in sea lion feces, and there is a large sea lion population on Año Nuevo Island that may also be adding mercury to the coastal waters. Elephant seals are fasting during most of their time on the beach, however, and aren't excreting much at all. The seasonality of the methyl mercury levels at Año Nuevo implicates molted pelage as the main source. According to Cossaboon, the dramatic increase in methyl mercury in the water during the molting season resulted in levels greater than those observed even in the highly urbanized San Francisco Bay estuary. Industrial emissions, mostly from the burning of coal, have increased the amount of mercury in the marine environment two- to four-fold over preindustrial levels, and global emissions are expected to continue increasing for at least the next several decades, according to Flegal. "This internal recycling back into the coastal environment just adds to the problem," he said. A related study published earlier this year by another group of researchers at UC Santa Cruz found that mercury concentrations in the blood and muscle of elephant seals were among the highest concentrations ever reported for a marine predator. Published June 17, 2015, in the Proceedings of the Royal Society B, the study found that the mercury levels varied with the hunting strategies of the seals, which were tracked during their foraging migrations throughout the North Pacific Ocean using satellite tags. The highest concentrations of mercury were found in elephant seals that foraged offshore and at the greatest depths. The lowest concentrations were in seals foraging in Northern coastal waters. According to first author Sarah Peterson, a graduate student in ecology and evolutionary biology, 99 percent of the animals studied had blood mercury levels that exceeded the threshold for clinical neurotoxicity in humans. "It is important, however, to be cautious in trying to use that threshold for another species," Peterson said. 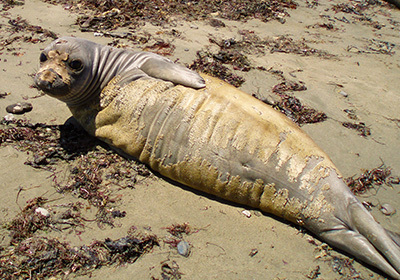 "We do not know what these concentrations mean for elephant seals." According to Flegal, studying the neurological effects of mercury in humans is extremely difficult, and in a wild animal population it is almost impossible. Peterson is also first author of a recent paper evaluating hair samples as an indicator of blood mercury levels in four pinniped species, including northern elephant seals and California sea lions. This study also found that mercury levels in elephant seal hair were quite high, she said, and higher than levels in hair from California sea lions that were sampled just off the mainland at Año Nuevo Island. Peterson's coauthors on both papers include Daniel Costa, professor of ecology and evolutionary biology at UC Santa Cruz, and Joshua Ackerman, a U.S. Geological Survey wildlife biologist. In addition to Cossaboon and Flegal, the PNAS paper was coauthored by Priya Ganguli, who is now at the Woods Hole Oceanographic Institution. 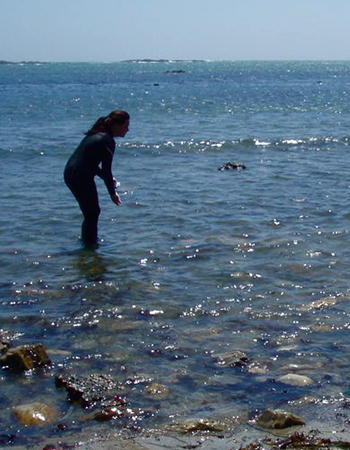 This research was supported with funding from Stevenson College (UC Santa Cruz), the Dr. Earl H. Myers Oceanographic and Marine Biology Trust of Pebble Beach, and the Robert & Patricia Switzer Foundation.